The crew from J.R.'s BBQ worked to feed the hungry crowd. 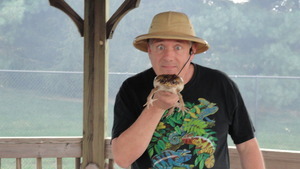 Just as the first of two Elvis tribute shows was starting at the Penn Township Annual Community Picnic and Health & Wellness Fair, Curtis Mason glanced around the park that was packed with families. "I bet we will top 5,000 people today. And the food, well, it's not going to last!" he said. He was correct on both counts. 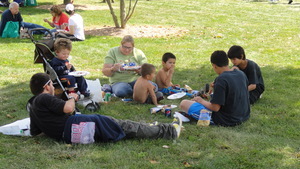 A record number of people attended this year's picnic and the food ran out at about 2:45 p.m., which wasn't bad considering the event was scheduled to end at 4 p.m. The free event, now in its ninth year, would not exist without Mason, Penn's longtime chairman of the Board of Supervisors. While he gets lots of help from fellow supervisors and other township officials and volunteers, Mason is the one who personally contacts dozens of local businesses and individuals, asking for their financial support. According to Mason, volunteers really stepped up to the plate this year. and the Living Faith Community Church, and it really made a difference," he said. Many guests come for the barbeque lunch, as evidenced by the continuous line snaking through the park. J.R.'s BBQ was once again at the site, cooking chicken, burgers and hot dogs. "It's one of the biggest events we do. 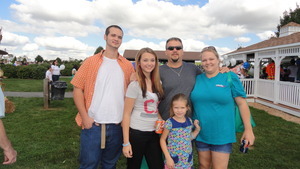 Just a great family day," said Rob Tonge of West Grove as he flipped a row of burgers and fragrant smoke wafted toward the line of people making their way to the food tent. "We've been coming here the last few years and I can tell you the burgers are worth the wait in line," said Heather Kilpatrick, a resident of Oxford. Ira Shatley added, "I like the chicken. Just thinking about it is making my taste buds jump!" 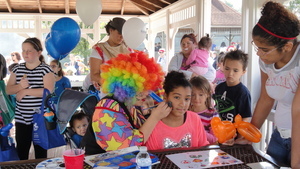 Others were drawn by the kids' fun, like Jungle John's reptile and balloon shows, face-painting and giant slides. This was the third consecutive year that Jesse Garron presented his Live Elvis Tribute. His two shows, each an hour long, delighted old and new Elvis fans alike. Mason smiled at his 85-year-old mother, who was sitting with friends in the first row. "I think she really believes it's Elvis," he said. Added to the entertainment this year was a two-hour Motown show by Coast2Coast. "Everyone just loved them," Mason said. "I knew they would. They are incredible entertainers from center city Philadelphia, and they play a lot of big venues. We definitely want to have them again next year along with Jesse's Elvis Tribute." soccer field gave kids an opportunity to burn off some steam while another booth let them try goal kicking. Jennersville Regional Hospital, co-sponsor of the event since its founding, offered their popular health screenings and added a game to encourage people to visit different areas of the hospital. Participants could earn hospital "bucks" by taking part in various activities, such as taking a hayride around the hospital campus, having a screening, taking a short hospital tour, touring the mobile PET scanner or voting on a name for the surgery center. Then, each five "bucks" earned entitled a participant to one drawing entry. The prizes were a $200 gift certificate to Giant, a $100 gift certificate to Twelves Grill, a 32-inch flat screen TV, an iPad Mini, a one-year YMCA family membership, or a day trip to New York City with Senior Circle to see "A Christmas Story."